Bitcoin and other cryptocurrencies were under pressure Monday morning. The selling pushed bitcoin to below $3,400 a coin, booking its lowest level since December 17, 2018. 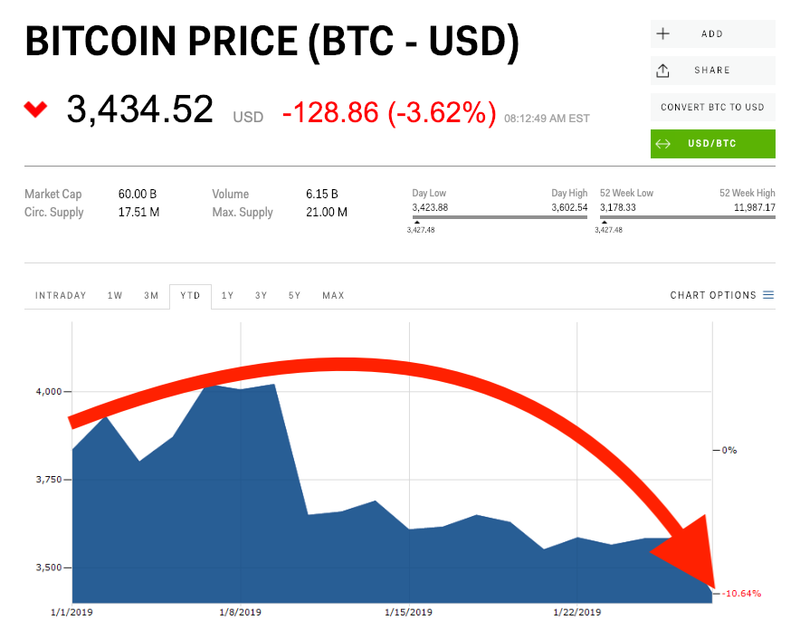 Bitcoin, the largest cryptocurrency by market cap, was down as much as 4.8% to below $3,388 a coin early Monday, printing at its lowest level since December 17, 2018. That was not far above $3,136, bitcoin’s lowest level since September 2017. Its rivals ether (-7.21%), litecoin (-4.7%), and bitcoin cash (-8.77%) were also under pressure. “The cryptoasset movement today is nothing more than technical,” Mati Greenspan, senior market analyst at eToro, told Business Insider. Investors in the digital currency saw its price explode in 2017 as cryptomania swept over the world. Bitcoin began 2017 worth less than $1,000 a coin before soaring more than 2,000% to a high of $19,511. However, the year of 2018 was a different story, with the cryptocurrency’s value plunging by 70%. So far this year, bitcoin is back to its bad habits of 2018, down 10%.